For children with a common middle-ear problem, a simple procedure with a nasal balloon can reduce the impact of hearing loss and avoid unnecessary and ineffective use of antibiotics, according to a new study led by researchers from the University of Southampton. The study is published in CMAJ (Canadian Medical Association Journal). It is very common for young children to develop otitis media with effusion (OME), also known as ‘glue ear’, in which the middle ear fills with thick fluid that can affect hearing development. There are frequently no symptoms, and parents often seek medical help only when hearing difficulties occur. “Unfortunately, all available medical treatments for otitis media with effusion such as antibiotics, antihistamines, decongestants and intranasal steroids are ineffective and have unwanted effects, and therefore cannot be recommended,” says co-author Dr Ian Williamson from Primary Care and Population Sciences at the University of Southampton. Approximately 200,000 children per year in the UK either attend GPs or are seen in the community per year with OME. There is a four in five chance a child will get an ear effusion in the first 10 years of their life. Researchers from the United Kingdom undertook an open randomised controlled trial to determine if autoinflation with a nasal balloon could be used on a large scale to benefit children in primary care settings. The child blows through each nostril into a nozzle to inflate the balloon, which then sends air into the middle ear helping to return the pressure to normal which clears the fluid build-up. The effectiveness of this procedure has been shown only in small trials in hospitals. This latest trial involved 320 children aged 4 to 11 years from 43 family practices in the UK who had recent histories of OME with confirmed fluid in one or both ears. The children were randomly assigned to either a control group that received standard care or a group that received standard care with autoinflation three times a day for one to three months. 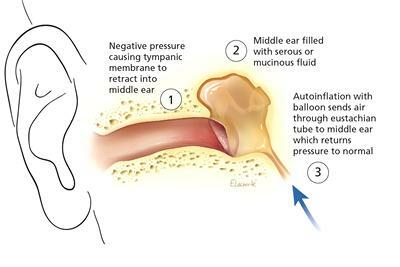 The children receiving autoinflation were more likely than those in the control group to have normal middle-ear pressure at both one month (47.3 per cent and 35.6 per cent, respectively) and three months (49.6 per cent and 38.3 per cent, respectively) and have fewer days with symptoms. The authors suggest that this treatment should be used more widely in children over the age of four to manage OME and help treat the associated hearing loss. In a related commentary, Drs Chris Del Mar and Tammy Hoffman from the Centre for Research in Evidence-Based Practice at Bond University in Queensland, Australia, said: “At last, there is something effective to offer children with glue ear other than surgery. Surgery to insert drainage tubes can help a select minority of children. “Autoinflation is one of a number of effective nondrug interventions typically underrepresented in research and clinical practice,” they say. The authors note that there are barriers to using non-drug therapies widely in clinical practice. In the case of autoinflation, doctors need to know about the technique’s effectiveness and how it is done, and must be able to instruct patients and families in how to use it. The Royal Australian College of General Practitioners recently launched the free Handbook of Non-Drug Interventions (HANDI) and will soon include autoinflation as a treatment for otitis media with effusion.